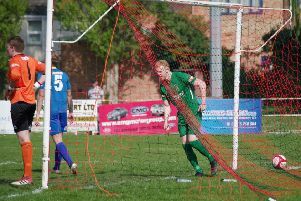 A goal deep into added time condemned Brighouse Town to a shock 2-1 defeat at Burscough yesterday. Elliott Nevitt struck with four extra minutes played at Ormskirk, Lancashire to settle the Evo Stik NPL Division One North contest. It was only bottom side Burscough’s fourth league win of the season and Brighouse dropped a place to ninth, below Colne, as a result. The hosts struck first through Callum Mahoney after seven minutes but Tom Dugdale continued his scoring streak with an equaliser from a narrow angle after 12 minutes, following Luke Parkin’s good ball. Brighouse are at home to Scarborough Athletic, who are fifth after losing yesterday’s top of the table game by 3-1 at home to Lancaster City yesterday.